In the tradition of Disney's musical masterpieces, Pocahontas and Pocahontas II: Journey To A New World bring to life a fun-filled adventure of hope, courage, and friendship. Now these beloved animated tales burst with "all the colors of the wind" for the first time ever in vivid high-definition. Experience the vibrant animation, amazing music, and spirited adventure like never before with both movies! Featuring an all-star cast of voice talent, award-winning music and songs, and new bonus to delight the entire family. Most of Disney�s �direct-to-video� animated films tend to be mediocre at best, and 1998's Pocahontas II: Journey to a New World did nothing to reverse that trend. The movie picks up a few months after the events of 1995's theatrical film Pocahontas. John Smith's back in England while Pokey (voiced by Irene Bedard) herself and the other Powhatans slowly acclimate to the presence of the Jamestown settlers. Of course, some problems must arise, and the concerns stem from the fact that apparently King James (Jim Cummings) believes Ratcliffe's (David Ogden Stiers) false story of what happened in Virginia. As such, Smith (Donal Gibson) is on the outs and war looks to be on the horizon. 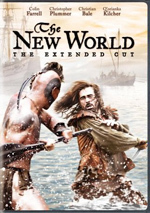 In a last-ditch effort to find the facts, the King dispatches John Rolfe (Billy Zane) to retrieve the Powhatan chief to come to England and discuss the matter. The English are under the mistaken impression that Pocahontas is the leader, however, and ultimately she sails to Britain to attempt to fix matters. Problems ensue, but a generally happy ending follows. I suppose World at least deserves some credit for not simply rehashing the events of the first film as many of these DTV offerings seem to do. However, the entire movie seems bland and generic. Clearly the story has some possibilities, but it goes down only the most obvious paths and does so with little spark or flair. Some might blame the failings of World on its origins. After all, Pocahontas isn't generally regarded as one of Disney's best pictures. Personally, I used to dislike it, but it's really grown on me in recent years, and I now find it to offer a pretty satisfying if inconsistent piece. However, World doesn't capitalize on the original's strengths, which came from its unusually dramatic and emotional tone, and the sequel comes across as little more than another "product" from the Disney factory. Possible spoilers ahead, so to skip them, just go past this paragraph and the next. Probably my least favorite aspect of the movie comes from its treatment of the Pokey/Smith relationship. Early in the film, Smith allegedly buys the farm, but you get no points for guessing he's not actually dead. Pokey mourns for roughly 32 seconds but gets back into the flow when she meets Rolfe. The two of them slowly develop an affection for each other, but the picture complicates when Smith turns up alive. How does World deal with this? It essentially makes Smith seem like a blowhard so Pokey can tell him that they want different things and go off with Rolfe. It's a contrived and unsatisfying way to end things, especially considering how nicely the first movie handled the Pokey/Smith affair. If they truly had the bond shown there, they wouldn't be able to so quickly dispel it here. Frankly, it leaves a bad taste in my mouth that the first flick�s intimate connection � and the noble Smith character � get subverted so simplistically here. The rest of the project remains pretty mediocre. The tunes in the original film were nothing special, though they could be quite catchy. The sequel's songs appear completely unmemorable and add nothing to the movie. Much of the original picture's vocal cast returns here, including Bedard, Stiers, Russell Means (Powhatan), and Linda Hunt (Grandmother Willow). Judy Kuhn also reprises her role as Pokey's singing voice. New performers include Zane and Jean Stapleton as Rolfe's houseservant Mrs. Jenkins. Notable in his absence is Mel Gibson, who did Smith the first time, but Disney gets the next best thing (? ): his brother Donal. This was a bit of a trend for DTV offerings: if you don't want to pay for the mega-star, hire his brother. For instance, they substituted Jim Hanks for brother Tom in Buzz Lightyear. Jim offered a better impression of his sibling than did Donal; I never thought Smith was voiced by Mel, whereas I briefly bought Woody came from his originator. One prominent change from the original film comes from World's weak animation. Disney�s TV department created the movie, and it shows, as the film generally looks crude, awkward and flat. The animation lacks life and verve; much of it just sits there and seems bland. Frankly, this is typical of the TV stuff, and I've seen worse, so I won't slam World too harshly for being what I expected, but don't think you'll get cinema-quality animation from this one. Don't think you'll get a cinema-quality Disney film either, because you won't. Pocahontas II creates a mildly-entertaining diversion but nothing more. The overall project seems lackluster and generic, without any of the original film's merits. The movie is watchable at best but not anything I particularly enjoyed. Pocahontas II: Journey to a New World appears in an aspect ratio of approximately 1.78:1 on this Blu-ray Disc. This ended up as a pleasing presentation. Overall sharpness appeared strong. Any softness I witnessed appeared to result from lackluster source animation; otherwise, the film looked tight and well-defined. Moir� effects and jagged edges appeared absent, and edge haloes weren�t observed. I also detected no signs of any print flaws. hairs or other concerns. Colors looked clean and bright. The movie offered some lovely hues that always were clear and bold. Black levels seemed nicely deep and dark, and shadow detail came across as appropriately opaque without any excessive heaviness. All of this delivered a solid transfer. I also felt pleased with the DTS-HD MA 5.1 soundtrack of Pocahontas II. The movie featured a soundfield that immersed you in the action from start to finish. The forward spectrum seemed lively, with music, effects and dialogue that appeared from the side speakers throughout most of the film. All of this audio blended together well, and the sounds panned cleanly and smoothly. The surrounds kicked in a great deal of ambient information and they added a nice dimension to the experience. Audio quality seemed strong as well. Dialogue always came across as crisp and accurate, with no edgy or dull elements, and intelligibility was excellent. Effects were clean and realistic, and they showed no signs of distortion. Music seemed fairly dynamic and bright, with good clarity and some solid low end. I detected nice bass from the effects as well, and the entire presentation seemed appealing. Like the visuals, the audio deserved an �A-�. How did this Blu-ray compare to the 2000 DVD release? Audio appeared a bit more dynamic and involving, while visuals showed stronger clarity and vivacity. None of this made World a good movie, but at least it came with a satisfying presentation. Pocahontas II includes only one notable extra: a 1937 animated short called Little Hiawatha. This nine-minute, 11-second �Silly Symphony� works fairly well, as it proves to be mildly charming and entertaining. However, one scene provides the most adorable bunny ever recorded on film; Hiawatha attempts to play the hunter and shoot this rabbit with his arrow, but there's no way he can do so in the face of its quivering cuteness. As the disc starts, we encounter ads for Cinderella and Finding Nemo. These also show up under Sneak Peeks along with promos for Disney Parks, Secret of the Wings, Planes, The Aristocats, The Rescuers, The Rescuers Down Under and Beverly Hills Chihuahua 3. No trailer for Pocahontas II shows up here. The package also includes a DVD Copy of Pocahontas II. This gives us a full retail version with a handful of extras. Does the Blu-ray lose any extras from the old DVD? Yes, but not much: it axes a storybook and a trivia game. The DVD lacked notable bonus materials anyway, so it couldn�t drop much. Pocahontas II: Journey to a New World does nothing to further the weak name of Disney's "direct-to-video" films. The movie provides an uninspired and mediocre extension of Pocahontas that largely falls flat. The Blu-ray delivers excellent picture and audio but lacks significant supplements. This turns into a strong presentation for a forgettable project. 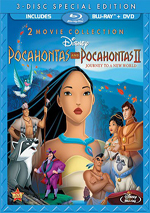 Note that Pocahontas II can be purchased only as part of a two-movie collection. 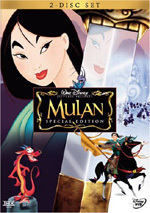 The Blu-ray also comes with the original Pocahontas as well as DVD copies of both films.